• The Magical Letters originate from the Quabbalah, an ancient set of teachings in the art of manifestation. When used with meditation, the Magical Letters have the power to amplify and concentrate our creative and healing energies and intentions. Each letter has its own Divine Virtue, and is associated with its own Color, Element (Fire, Air, Water, Earth  see Practical Alchemy), Sensation, Musical Note, and Part of the Body. In the past, however, researching the letters and their qualities in order to use them for a specific purpose has often proved cumbersome and intrusive. For this reason, the author sought a way to make this spiritual system more accessible. The result  after a year's work and study  was the Magical Alphabet. • The Magical Alphabet is a set of beautiful cards, each bearing one of the Magical Letters on the front and a description of the aspects of each letter on the back. These powerful and colorful images, along with their inner meanings, help us to focus in our spiritual meditations. 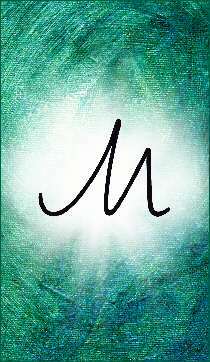 More than that, like Reiki symbols, the letters have inherent powers of their own. When used for the purpose of creating our goals and dreams, they contribute this power to our own energy and intent. Used to spell out angelic names, they call in these vibrations and teach us the attributes of the angelic source. Thus, we assimilate these energies for spiritual growth, and our intentions manifest more quickly and with greater purity. Get away from the habit of trying to "figure it out,"
Dissolve the issues that prevent you from achieving your dreams. A little over a year ago, I learned about the use of the Magical Letters as keys to the powers of alchemy: the science of physical and spiritual transformation. * Soon, my meditations with these letters had become an important part of my spiritual work. And I realized that I needed to have the letters and information about them in a convenient  and beautiful!  form. So I then created the Magical Alphabet: a deck of cards, each with a Magical Letter on one side and its meaning and power described on the other. With these cards in hand before my meditations, I was able to determine quickly and easily which letter or letters I wanted to focus on, depending upon my needs and feelings. And once I'd chosen, I now had a beautiful "mandala" to help me fix the images and the colors upon my "inner screen." And by using the cards to physically form the sacred names of my angelic guides, I was able not only to call them in but to absorb their attributes in a new, "whole brain" way. When we meditate on the magical letters we are automatically "speaking" an ancient language. Becoming aware of the many qualities of the letters requires using all four of our brainwaves at the same time. In turn, this whole-brain thinking creates a wave of consciousness that connects with and resonates to the Universal Mind and the Unified Field of waveform energy, allowing our intended manifestations to occur. I have found the use of these cards so gratifying and powerful that I want to share them with you. If the hermetic traditions fascinate you, if the arts of alchemy "call out" to you, and if you are seeking a more powerful way of creating your dreams and visions, the Magical Alphabet may be for you. FOR MORE ABOUT THE CARDS AND THEIR MEANINGS, PLEASE GO HERE. TO ORDER THE MAGICAL ALPHABET, OR TO DOWNLOAD THE CARD IMAGES IN ORDER TO CREATE YOUR OWN SET, PLEASE GO HERE. EITHER WAY, YOU WILL BE ABLE TO ACCESS A DOWNLOADABLE MANUAL OF INFORMATION AND INSTRUCTIONS FOR WORKING WITH THE MAGICAL LETTERS, INCLUDING A GUIDED MEDITATION. *Our work with these cards is based in large part on the teachings of Franz Bardon and with his permission. For information on this and the study of alchemy and the hermetic sciences, please visit our Resources section. Thank you.